Visiting “ My Khe” beach, “Linh Ung”, “ Son Tra”, “Ba Na Hill “, which are the most famous tourist destinations in Da Nang, you’ll have a worth time to relaxed at this beautiful city. It was once voted to become one of the six most fabulous and attractive beaches in the world by Forbes (Travel magazine ). This beach attracts visitors not only by the blue sea but also by the white sand. It also have a number of exciting sea-tourism activities which take place from April to September. This beach, where is a good place for visitors to swim, take part in sea-activities as well as sports, stretching to more than 90m. What’s more, the system of coastal hotels such as Holiday beach Danang, Furama resort,… is also an ideal place to rest for travelers. If you come here, you will have an opportunity to taste a variety of seafood dishes from lots of restaurants. These dishes were made carefully, so you are able to enjoy them every day. It is 1 of the 10 most impressive cable cars in the world, including “ Suoi Mo – Ba Na”, “ Debay – Morin”,” Toc Tien – L’Indochine “ with 201 cabins serving 3,000 guests an hour. This place (1) is not only known for its impressive cable cars but also the hundreds of attractive destinations. You just need to visit here once, it’s easy to be conquered by its mysterious and exciting tourism activities. Have depended on French architecture, it’s located on 1489m- high mountain. Therefore, Ba Na Hill is also known as a miniature SaPa in Da Nang. Visitors will feel four seasons on the same day at this resort correctly. Furthermore, this is also a good condition for hundreds of flowers to live and grow such as broccoli, orchid, altiso, … in Le Jardin D’amour garden. Besides, the first impression of Ba Na Hill is the ancient beauty and luxuriousness of a mysterious European city. Moreover, you’re able to feel as you’re staying at Western because of the design looks like European style. There’re a number of interesting places such as Le Jardin D’amour garden, the Debay wine cellar,”Linh Mieu Ba” Pagoda,” Linh Ung “Pagoda, “Linh Phong Bao Thap”,… Especially, Asian Park is an amazing entertainment that you can not .forget. With your family and friends, you will explore here by taking part in free activities like climbing, watching 3D movies, going to the forest, etc. Da Nang people need to bring ID card, ID card or birth certificate for children. Tickets are valid only during the day. From about 8km southeast, Ngu Hanh Son is a scenic spot of 5 limestone mountains which rise from a sandy beach, covering an area of about 2 km2, including Kim Son, Moc Son, Thuy Son, Hoa Son, Tho Son. 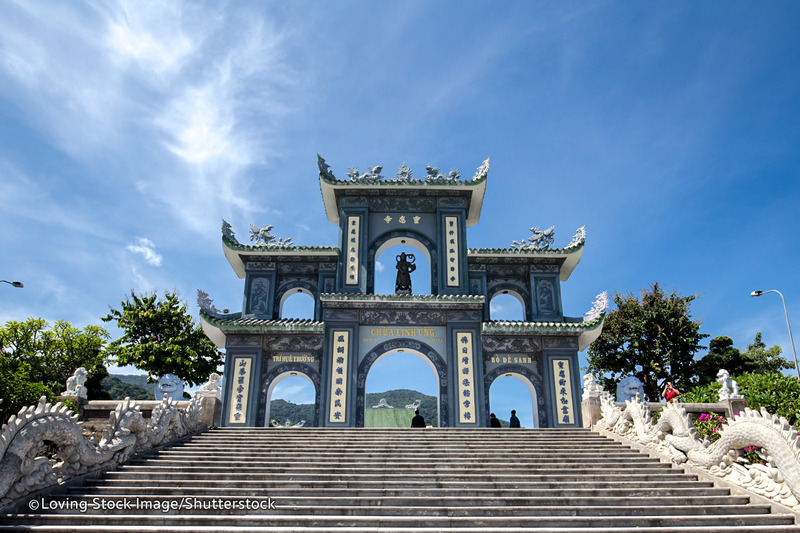 If the beaches with white sand make the tourists relax and fall in loved with its poetic beauty or Ba Na Hill create a paradise for everyone to have a great holiday, Ngu Hanh Son is telling mysterious and spiritual stories for visitors. Ngu Hanh Son is known as a project of the ancient “Cham people” with “Tran Quang Dieu’s mother ancient ‘’, Temple of Ngoc Lan Princess … and also “Núi đá chồng “, “ Ba Tho “ cave, “Kim Son” mountain, ‘’Am Phu” cave, …. Furthermore, Rock-capturing villages which were developed over 400 years of age are interesting pit-stop that you can’t ignore if you visit “Ngu Hanh Son”. It is also one of the largest stone sculpture villages in VietNam, exporting stone carvings to the world . On the days of a new year, visitors come here in order to pray for a good and peace new year. It seems that here is the collection of Asian cultural works representing 11 countries : Japan, Indonesia, Singapore, Korea, India, Nepal, Thailand, Cambodia, China, Vietnam. The ticket’s price at Sun Wheel Danang is 200,000 VND / person. The ticket includes entertainment activities. Known as a city with bridges, Da Nang owns about 10 bridges, the most impressive ones are the four bridges: “Cau Rong –EEA award”, “ Cau Song Han “, “ Tran Thi Ly – the special bridge” , “ Thuan Phuoc bridge”. These bridges are not only places for trading and traveling but also the face of this beautiful city. At night, when the city lights up this is the most suitable time for visitors to admire the colorful and beautiful city. Guests can choose to go sightseeing on “Han River” to view the city detailed. Time for visiting famous tourist bridges in Da Nang. “ Cau Rong” : From 21h00 to 21h30 from Saturday to Sunday. “ Cau quay Song Han “ : 23h30 the from Monday to Sunday. In addition, “Tinh Yeu” bridge on Tran Hung Dao, where couples dating, exciting sightseeing, is a worth place. “Đeo Hai Van “, also known as Deo May, is a mountain range crossing Bach Ma, which runs close to the sea, dividing the border between Thua Thien Hue province and Da Nang city. Because of its height and view, Hai Van Pass used to be called ‘Thiên hạ đệ nhất hùng quan’ by Minh Mang king. In the past, there are not have many passer because the road has not been cleared, expanded and there are many animals .However, “ Hai Van” is considered as one of the interesting stopovers that visitors should not ignore after. From “Hai Van Quan”, tourists will admire a beautiful view of a mountainous embracing the city. This city is as a beautiful small oasis between heaven and earth. About 30km from central of Da Nang, Hoi An is known as one of the few remaining cities in Vietnam that possess the characteristic beauty that is hard to find anywhere else. The ancient town of Hoi An impresses visitors by its very old houses which still remain the beauty of the ancient Vietnamese. What’s more, Hoi An is known as a real paradise for tourists to explore the beautiful and emotional Vietnamese . With the its beauty , “Hội An” is spend more love by foreign tourists. Local people often jokingly said that Hoi An is the city of the foreign tourists, because there are lots of the tourists in any corner of Hoi An. Throughout Hoi An , you’re able to enjoy the famous dishes here such as: “ Cao Lầu phố Hội, Mì Quảng, chè khúc bạch” . This mineral springs are considered to be a hot destination that you can not ignore in order to enjoy full emotion when coming to this city. “ Than Tai” mineral springs are located at National Road 14G, Hoa Phu, Hoa Vang, Da Nang. At here, you will experience a different feeling when being sinked in the nature, dreamed with the forests of “ Nui Chua” . ‘’ Than Tai “ hot spring is known for its present from the nature. Children from 1m – 1.3m: 100,000 VND / person. This, which is located in “ Hoa Phu, Hoa Vang, Đa Nang “, is one of the attractive tourist destinations of city. You should spend time challenging yourself to overcome the adventure. In addiction, visitors can also join the high-rise zipline, lunch and dinner .I assure that you “ll have unforgettable memmorises when coming to Da Nang.